While two police detectives from two countries try to stop a killer on The Bridge, FX is trying get viewers to watch this new series. Will it be a ratings hit? Will the cable channel cancel the series or renew it for a second season? Stay tuned! 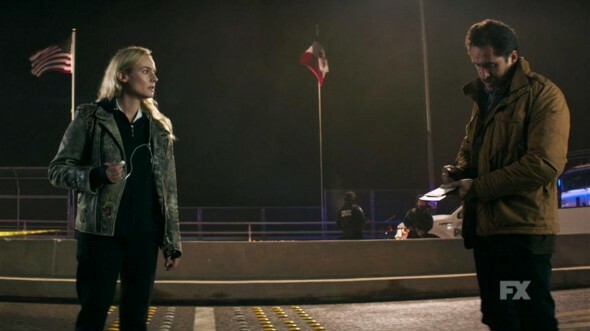 Airing on Wednesday nights, The Bridge features the talents of Diane Kruger, Demián Bichir, Annabeth Gish, Thomas M. Wright, and Ted Levine. There are 13 episodes. Below are the show’s TV ratings, the best way to tell if this series will be cancelled or renewed. These figures will be updated as the weeks progress so you can check in to see how things are going. Final season averages: 0.6 rating in the 18-49 demographic with 1.77 million total viewers. As previously mentioned, the show will return for a second season. 0.5 demo rating (-17% change) with 1.43 million (+7% change). Season averages: 0.63 in the demo with 1.77 million. 0.6 demo rating (0% change) with 1.34 million (-10% change). Season averages: 0.64 in the demo with 1.80 million. UPDATE: FX has renewed the show for a second season. 0.6 demo rating (-14% change) with 1.50 million (-17% change). Season averages: 0.65 in the demo with 1.84 million. 0.7 demo rating (+40% change) with 1.80 million (+9% change). Season averages: 0.65 in the demo with 1.87 million. 0.5 demo rating (-17% change) with 1.65 million (-7% change). Season averages: 0.64 in the demo with 1.88 million. 0.6 demo rating (0% change) with 1.77 million (+7% change). Season averages: 0.66 in the demo with 1.91 million. 0.6 demo rating (-14% change) with 1.66 million (+1% change). Season averages: 0.67 in the demo with 1.93 million. 0.7 demo rating (0% change) with 1.63 million (-15% change). Season averages: 0.68 in the demo with 1.98 million. 0.7 demo rating (+17% change) with 1.92 million (+10% change). Season averages: 0.68 in the demo with 2.05 million. 0.6 demo rating (-14% change) with 1.75 million (-2% change). Season averages: 0.68 in the demo with 2.08 million. 0.7 demo rating (+40% change) with 1.78 million (+2% change). Season averages: 0.70 in the demo with 2.19 million. 0.5 demo rating (-44% change) with 1.74 million (-43% change). Season averages: 0.70 in the demo with 2.39 million. 0.9 rating in the 18-49 demographic with 3.04 million total viewers. Season average: 0.90 in the demo with 3.04 million. It was a very positive start to the new drama. The ratings were on par with the debut of The Americans earlier this year. What do you think? Do you like The Bridge TV series? Do you think that it should be cancelled or renewed for a second season? It is a great show. Keep this one and get rid of a reality show. Love the show!!! lets go season 3. Yeah!!!!!!!!!!!!!! It was renewed for a second season…YAY! Excellent show, I was a bit put off in the beginning as I did not understand Diane Krugers character…I actually had to research what she was about…When it came together, I was on board…Demia’n Bichir I have loved since I saw him in A Better Life…Extremely talented actor…Very well executed show, gritty full of great twists and turns…Yes, I do hope this is renewed many times over…. Great show-acting, dialogue, setting all very realistic. Sure hope it’s renewed.